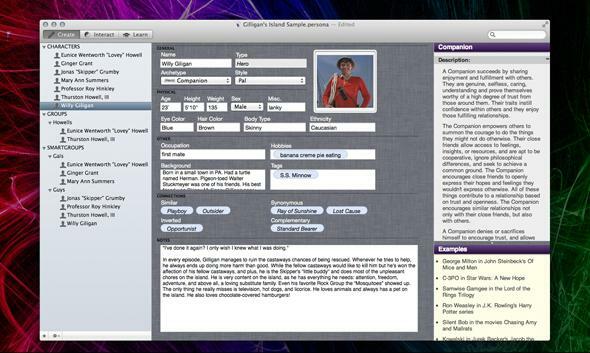 Writing apps Scrivener, A Novel Idea, Persona: Tech to boost productivity and creativity. Writing apps can make you more productive. Can they make you more creative? Persona, like other fiction-writing apps, helps you organize your ideas to enhance productivity. Microsoft Word can sometimes feel like the place where creativity goes to die. Its icons evoke the wan cubicle world of ’90s office culture: impassive clipboards, boring scissors, a squat dour printer. (And don’t get me started on Google Docs.) Word’s corporate vibe makes it a less-than-ideal sanctum for novel writing, or really any kind of imaginative writing, and perhaps that’s why a new crop of apps has emerged to help today’s underserved Woolfs and Melvilles find literary greatness. The fiction-writing app is a curious creature, because it can only sell creativity by downgrading it. It operates outside of the traditional, mystery-swathed model of inspiration, in which brilliance floods down on us from heaven, and instead reduces invention to a series of steps. In lassoing and regimenting the muse, fiction apps evaporate some of writing’s pain, but also some of its glory. Or maybe they just help us procrastinate! Either way, we’ve rounded up a few of the digital aides available to seekers of literary immortality as well as those of you who really, really hate Word. 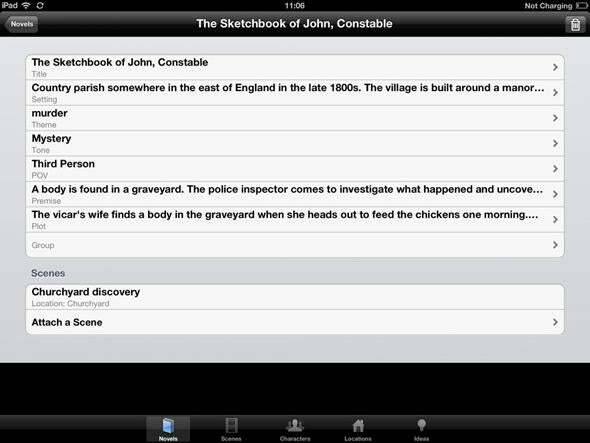 A Novel Idea gives you a sketchbook where you can fill in details related to your story. 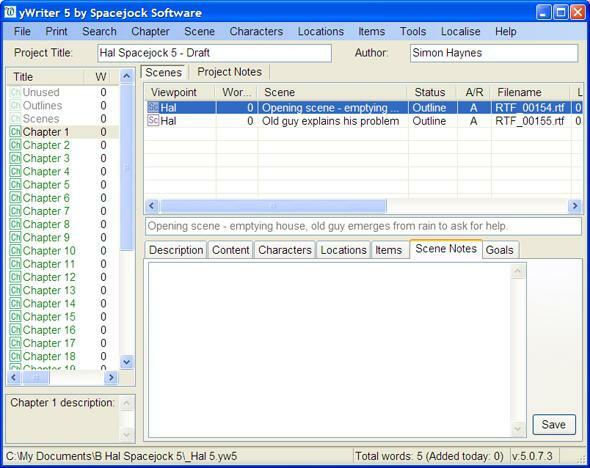 Similar to A Novel Idea is yWriter5, the brainchild of designer, programmer, and science-fiction author Simon Haynes. This free program cordons your opus into discrete chapters, each of which you can annotate with four types of metadata: “character(s),” “goal,” “conflict,” and “outcome.” Drag and drop chapters around a “storyboard” to get a visual sense of the overall structure and, for a healthy dose of stress, set yourself a deadline with reminders of what needs to get accomplished every day. The Persona app allows you to generate a freestanding database of possible cast members in order to “organize and centralize your character data” around “archetypes” you’ve designed. You might, for example, make a folder full of buxom blond ex-wives, or exacting-but-warmhearted teachers, or quirky anomic Brooklynite twentysomethings, or struggling tech-savvy genius authors who use Persona. Got writer’s block? Take a trip through Lists for Writers. Lists for Writers has a slightly different goal: dispelling writer’s block. 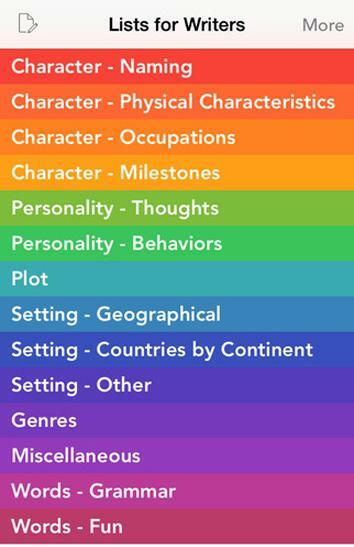 The app consists of lots of lists dreamed up and populated by its creators: You can browse through male and female names, articles of clothing, occupations, personality traits (including phobias and philias), hobbies, “seven basic plots,” and “36 dramatic situations.” “Lists for Writers relieves some of the mental burden of generating possibilities from scratch,” its site says. If that sounds lazy, think of the app as a magician’s hat out of which you can pull random ideas to weave together into a story. Where might “Florida” + “clairvoyance” + “eggplant” + “vengeance taken upon kin for kin” take you? What about “badminton” + “Joanie” + “a talking cat”? If popular literature takes a decisive turn toward wacky experimentalism over the next few years, thank Lists for Writers (as well as Donald Barthelme). Then there are the apps that aim to tighten and sparkle up your prose. Hemingway will kill your darlings until each sentence is bold and clear enough to satisfy Papa—it highlights adverbs, unnecessarily flashy words (such as “utilize” for “use”), and instances of passive voice. Long, rambling sentences get shown in yellow; very intricate and complex clauses characterized by repetitiveness and awkward phrasing are bathed in a haze of red as if to put the writer’s inner pilot on alert that an imminent stop is required—though if you persist through the red to see if the furious ghost of Hemingway eventually appears to admonish you for unconscionable verbosity, you will discover that, unfortunately, it does not. I checked. One worry with apps like these is that they will produce uninspired cookie-cutter novels. Should writing be easy? Composing by numbers, or by consulting a dropdown menu, seems destined to result in a clanky product, not a living thing. Then again, I am invoking the notion that creation (what God, a parent, or an artist does) is different from production (what a factory does). Maybe that binary is ripe for dissolution, as Andy Warhol demonstrated for visual art in the ’60s! Or maybe the answer is an interface that, despite its pragmatic, process-based hacks, takes a gloriously open-ended approach to content. Enter Scrivener. A lot of writers I reached out to love Scrivener. “It’s excellent. Can’t recommend it enough,” says Jeff Wilser, who used the app to write his forthcoming book The Good News About What’s Bad for You … and the Bad News About What’s Good for You. It’s “not one of those punitive, God-will-condemn—no, embarrass—you-if-you-don’t-write apps,” says Melinda Salata, an English teacher in Bethesda, Maryland. In 2008, Scrivener earned a rapturous review from Virginia Heffernan in the New York Times. “The happy, broad-minded, process-friendly Scrivener software encourages note-taking and outlining and restructuring and promises all the exhilaration of a productive desk: ‘a ring-binder, a scrapbook, a corkboard, an outliner and text editor all rolled into one,’ ” Heffernan wrote. But Scrivener’s starry-eyed apostles notwithstanding, a crucial question remains: Are there any writing apps out there that will actually make you more creative? Not more fiercely productive. Not more efficient. But more imaginative, fresh, inspired, and afire with what Wordsworth called the “auxiliary light” of the mind? Does the app exist that will make your novel come out not simply faster and cleaner, but better? Then again, I wrote this article in Microsoft Word.